Comply with ASTM F-1249. TAPPI T557. JIS K-7129. Water vapor transmission rate (WVTR) testing. Fully automated with reduced testing times. 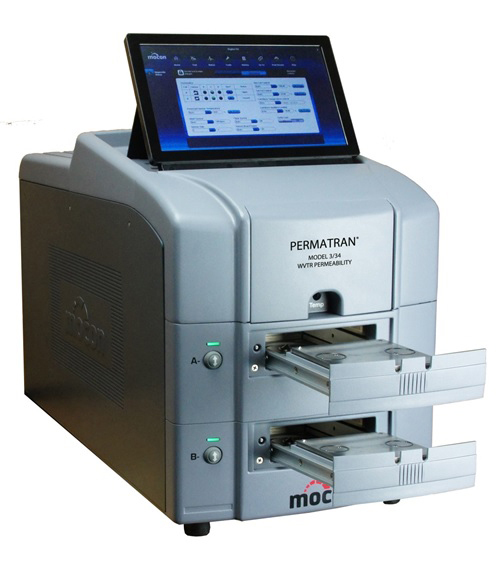 Laboratories that test unknown films will appreciate the fully automatic testing mode. Simply place the film, set RH and temperature, start the test and the instrument will determine the parameters and conduct the test automatically. Water Vapour Transmission Rate measurement of Pastic Films, Laminates, Foils, Pouches, Bottles, Containers, Blisters, Closures, Sheetings etc. Reaserch & Development sector with latest features of mocon WVTR 3/34 G.